Le Beau Serge is a film which will forever have a place in film history. It may not be as beloved as François Truffaut’s The 400 Blows, which would arrive the following year, or as remembered as Jean-Luc Godard’s Breathless in 1960, but neither of these films would have been possible without the creation of Le Beau Serge. These three among others practiced a critical discourse in the publication Cahiers du cinema which would mark a new era for film theory, but it was Claude Chabrol’s debut feature which is forever associated with the beginning of nouvelle vague cinema. 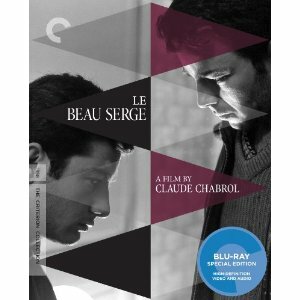 Predominately focused on issues and subjects of youth, Le Beau Serge does not seem to fit into this movement easily at first. Stylistically it is easy to see the ways in which Chabrol made the first great steps in this movement for French cinema; using real locations, natural lighting and relatively unknown actors as stars. The narrative must be investigated to see the themes which also tie Le Beau Serge to nouvelle vague cinema. The issues of youth seem to be of the disillusionment once youth has been lost and the harsh realities of life have taken over. The film focuses on the friendship of two men who reunite after going separate ways. Both seem to have had promising beginnings, so when François (Gérard Blain) returns to his quiet hometown to recover from a spot on his lung likely to be tuberculosis, it comes as a surprise that his childhood friend is now the town drunk. Serge (Jean-Claude Brialy) somehow failed to live up to his promise and drives a truck for a local lumber company instead, but the drinking seems to be a way for him to drown his worries about an impending child. Serge’s wife, Yvonne (Michéle Méritz), is pregnant with their second child. The first one arrived with birth defects and as the pregnancy progresses, so does the amount that Serge attempts to drink each day. The film follows François in his attempt to pull Serge back from the edge, but there is no inspiring outcome to these efforts. We stay as the seasons change and the dreaded event arrives, but despite François’ best efforts to fix things, Serge seems incapable of change. When we leave the storyline it is difficult to know what the future holds for these two friends.